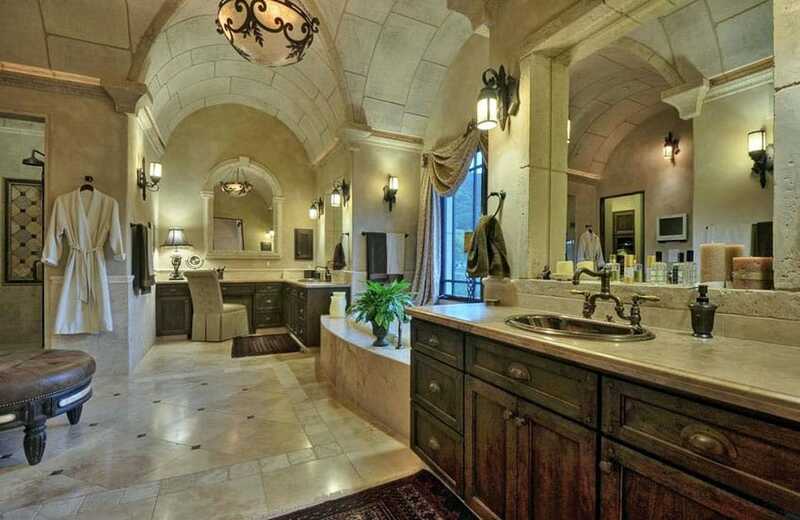 Welcome to our gallery of luxurious mansion bathrooms. These pictures show elegant master bathrooms with full of high-end decor, and glamorous furnishings. From dramatic rainfall showers, to large whirlpool bathtubs, and amazing architectural designs, you’ll find luxury features throughout these spaces. 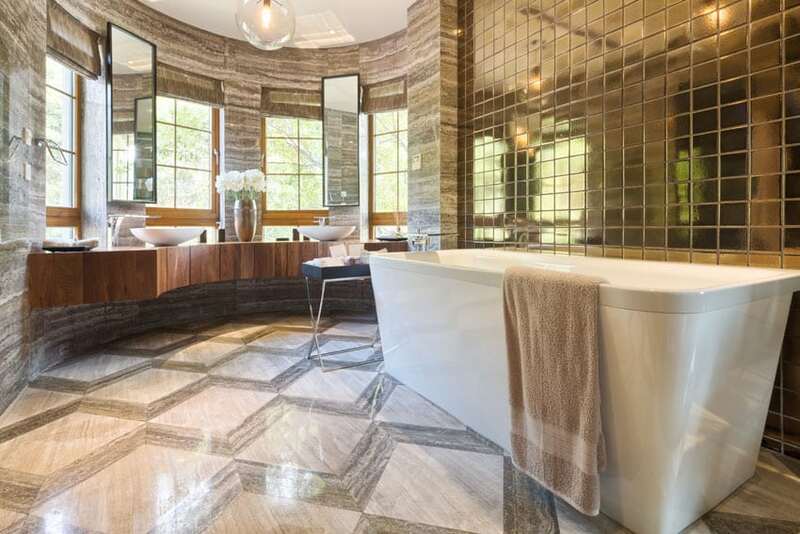 Take a look at these luxury mansion bathrooms and get ideas and inspiration for creating your ideal bathroom sanctuary. 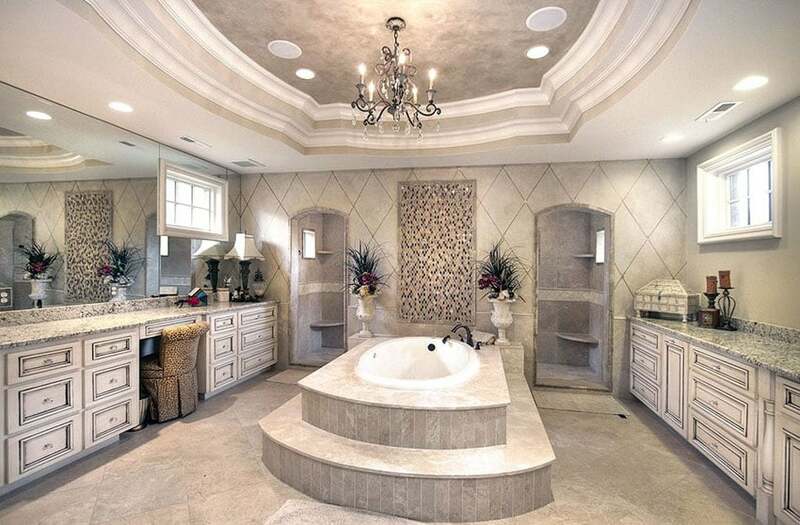 In the image above a pair of Corinthian style pillars with gold base and pedestal holds up the intricately painted circular ceiling over the circular Jacuzzi at the center of this luxurious bathroom. On either side, a pair of gold and leather benches sits before an expansive recessed vanity countertop with candelabra wall lamps. The walls are in a textured off-white paint, which goes well with all the gold trim and bronze mosaic tiles all around. A luxurious bathroom does not just mean a vast space and heavily detailed walls and trims, it also means more function. Many people will spend at least 20 minutes in their bathrooms every day, making it one of the most important parts of a house, and elevating it from just a place for hygiene to a place for reflection and relaxation. Although going for looks which include chandeliers, heavy trims and rare woods and stones is alright, here are some newer bathroom innovations to make your luxury bathroom serve you even better. Rainfall shower – When there is no space for a tub, the most luxurious item you can get for your shower space is the rainfall shower. Commonly installed on the ceiling at the very center of the shower space, the rainfall ceiling mimics an actual shower in the rain, with smooth, heavy drops coming in from above. Gold, oiled brass or hairline chrome finishes are good finishing options for luxury rain showers and taps. Bathtub – One of the most basic elements of a luxury bathroom is a bathtub. Although having a beautiful shower enclosure with rainfall shower is a blessing in itself, having a place to relax and take a long warm bath is key to achieving your dream luxury bathroom. Tubs can be customized in shape, with resin being an easy to maintain option that can come in matte finish. In addition, tubs can also be recessed, with steps leading up to the tub, so that the surrounding platform can be decorated with potted plants, candles, etc. Fireplace – Perfect for large bathrooms with bathtubs, the fireplace is a great way to heat up a bathroom, especially when users desire to lounge in the tub during the winter months. In addition, adding a decorative mantel or a low bench on the fireplace recess gives more options for decorative accessories. Heated flooring – For bathrooms with not enough space, space-heated floors are a good way to keep warm during the winter. Treated wood, particularly Cedar (also used in saunas) is one of the best options for heated flooring as it distributes heat well while remaining safely warm to the touch, so that users can still safely walk around the bathroom floor. In addition, the treated version of Cedar wood absorbs water, ensuring puddles are not formed, without warping and expanding itself. Custom built-ins – Many luxe bathrooms feature a walk in closet, which is very handy as all your clothes can be in one place. Many also stress the importance of drawers and cabinets under the lavatory counter, making enough space for hygienic products, cosmetics, linens and other bathroom needs. It is also very important that the material used for these built-ins (usually a combination of wood body and stone countertop) match well with the overall feel and color scheme of the bathroom. 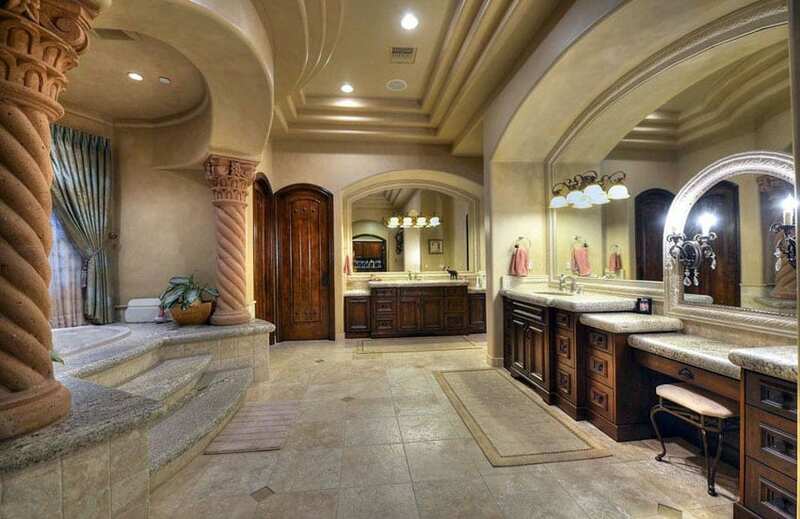 Bathroom furniture – Mansion bathrooms go beyond taps and toilets, especially when you have more space to accessorize. Some very important pieces of bathroom furniture include rugs, racks, shelves, benches and even upholstered seats. Including these kinds of features separates regular bathrooms from truly luxurious mansion bathrooms, and can also make your bathroom experience more comfortable. A favorite for many luxe bathrooms is the Ottoman, because it gives the space a classic look, while being easy to move and store around. A large Victorian style dressing room centers on a circular Ottoman with a black iron chandelier hanging over it. On one side, large mirrors are mounted onto the wall with carved white drawers beneath carrying a dark brown stone countertop. On the other side, the same brown stone is used for the built-up for the black painted metal bathtub, kept in an alcove with an intricately carved architrave. 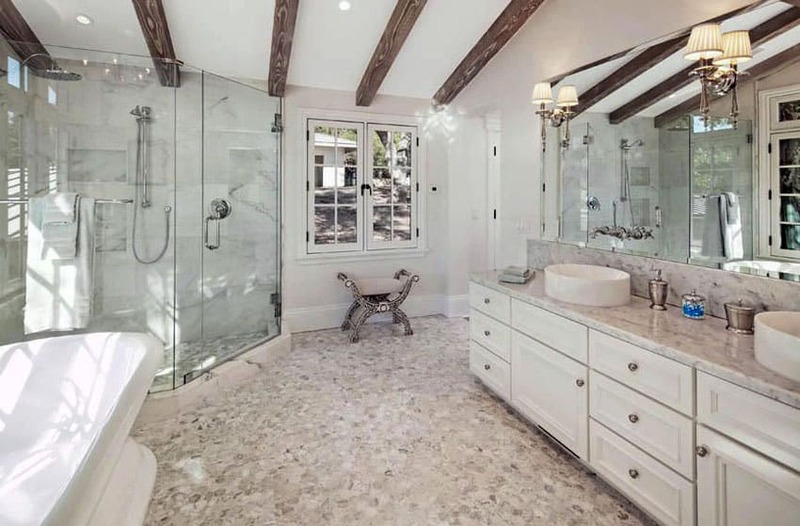 Mansion bathrooms frequently have separate rooms for the bathing area, shower, walk-in closet and vanity area to create the feeling of total luxury. Arched and vaulted limestone ceilings serve as the perfect backdrop to the dramatic black iron wall lamps and hanging chandelier illuminating this rustic mansion style bathroom. Oiled brass is used for the sink, taps, showerhead and towel rack, which goes well with the beige marble countertop and rustic wood vanity cabinets. The built-in tub faces a luxurious black metal mullioned window opposite a brown leather Ottoman. This mansion bathroom goes for a more Contemporary style, starting with the skylight at the center of the light grey bead board ceiling. The same light grey is used for the walls, contrasted by white baseboards and window trims. Other white accents include the free-standing Contemporary style tub, white tufted leather Ottoman and other white décor. To one side, a built-up drawer and shelf is provided for toiletries, robes and bench seating. This large bathroom is simple but comes with many bespoke features in brass, like the small set of tables. Centered on a soaking tub with a view of the outdoors, white shelves surround the small alcove, and the floor features Arabesque mosaic tiles. After the tub area, a his and her vanity is provided with matching green undercounter drawers, Calcatta marble countertops, and brown paneled walls culminating in a wall-mounted vintage lampshade. Large marble tile steps lead to an elevated white bathtub with oiled brass taps. A black iron chandelier hangs above the tub, tucked into a recessed ceiling done in brown stucco finish. 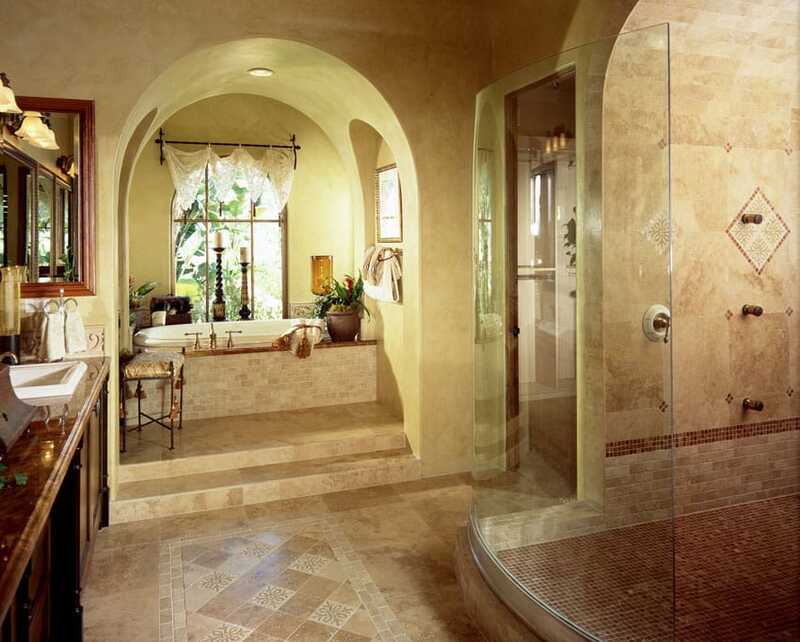 Beyond the tub, a mosaic wall with potted plants separates the doors leading to the shower and toilet. On either side of the expansive bathtub, salt and pepper stone countertops are lined up against the wall with undercounter drawers in white rusticated paneling. 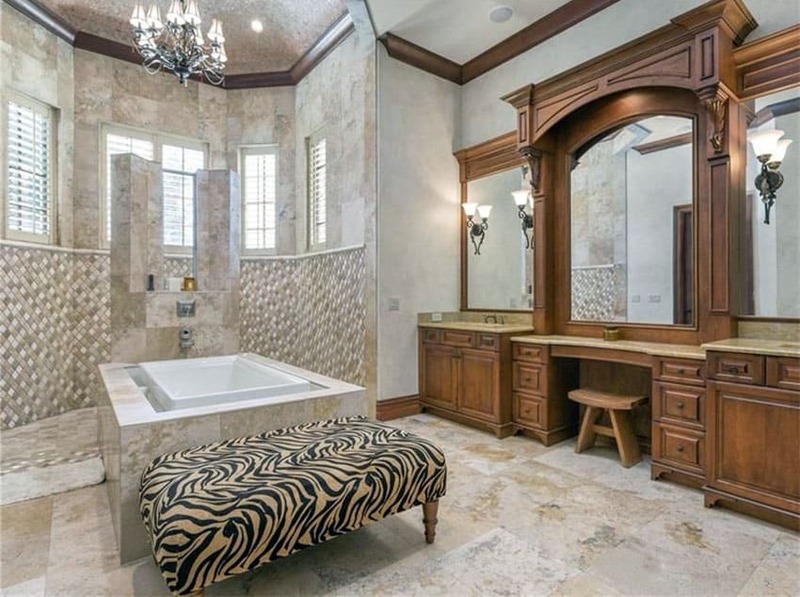 Tiger-striped stone countertops gives this large mansion-style bathroom a luxurious feel that goes well with the pair of crystal chandeliers hanging over the elevated bathtub and vanity counter, both with matching white paneled wood sidings. Dark brown walls are a good base to the white window trims and cornices, as well as the raised trims in between the tall vanity mirrors. 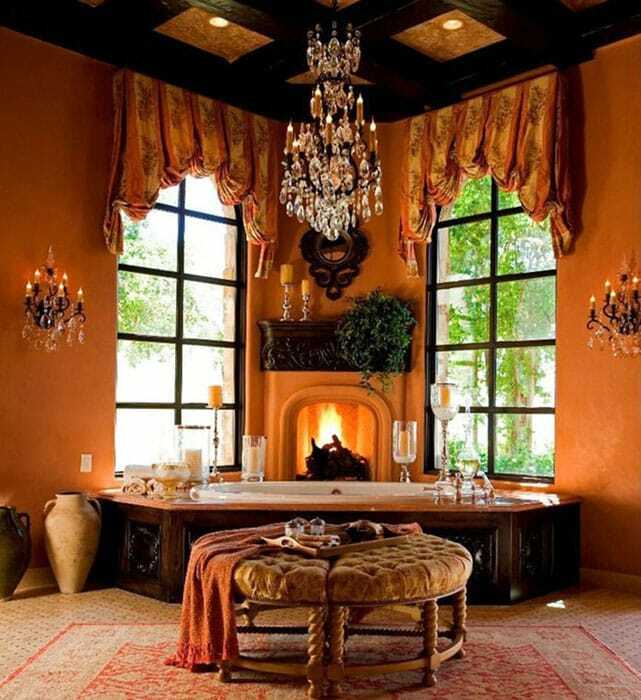 This luxury bathroom goes for a more Tuscan look with its bright orange walls, heavy yellow window drapes and black iron and crystal chandeliers. The white bathtub features a dark wood panel base, orange stone countertop, and a built-up fireplace behind it. The fireplace also features the same dark wood for its mantel, decorated with candles and a plant. 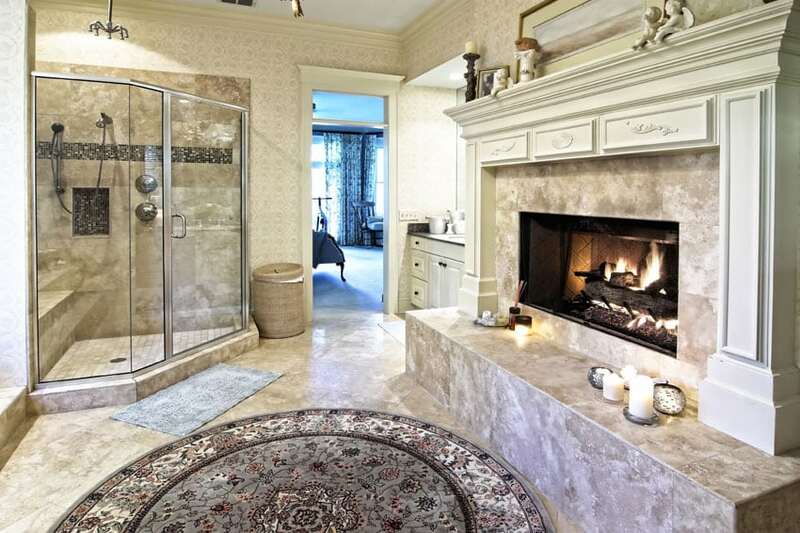 A pair of high windows frame the fireplace and provide light to the luxury bathroom. Warm brown stone tiles lining the entirety of this luxury bathroom provide a neutral background to the customized travertine stone bathtub with chrome finished water tap. The bathtub is framed by a large picture window on its front, and beside it, a large shower enclosure features a dual rainfall shower installed high onto the ceiling. The traditional style wood paneling on the bathtub base and matching vanity drawers go well with the gold taps and drawer handles. 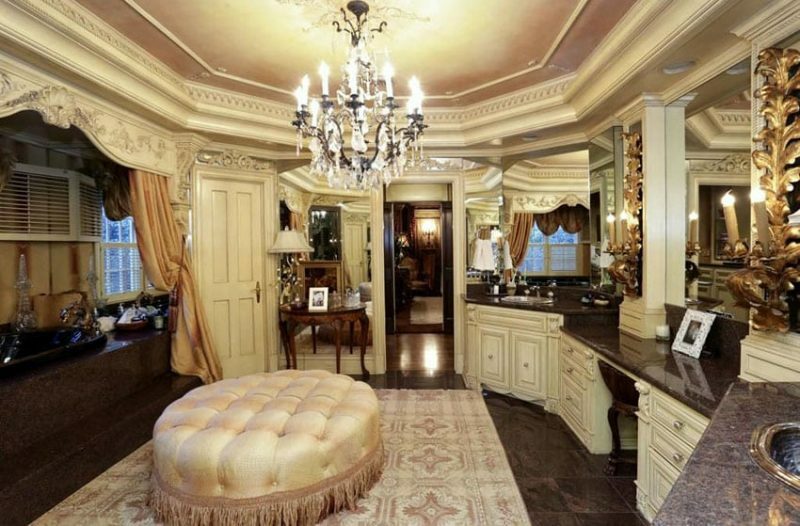 In addition, a crystal chandelier hangs over the bathtub, with the space multiplied because of floor to ceiling mirrors on either side of the tub. The floors and walls are in a simple beige stone tile, and to one side, some shelves are built onto the wall. Exposed wooden beams on the high ceiling and pebble-finished flooring give this luxe bathroom a more rustic, cottage-style feel. The vintage style window to one side and lampshade wall sconces also fall in with this theme. Carrara marble, which is used for many luxury bathrooms, is used for the walls in the shower enclosure, which feature a telephone shower and rainshower. A nice marble is also used for the countertop which features oval pedestal sinks with taps mounted onto the mirror wall. Hexagonal marble tiles are a unique feature to this traditional mansion style bathroom and goes well with the Calacatta marble countertop for the vanity which features a pair of white sinks with high mirrors and separated by brass wall sconces. The undercounter cabinets are in white paneled wood that matches the white bathtub and white leather square Ottoman. To one side, a large glass enclosure separates the shower area which features dark stone mosaic tile walls and feature a telephone shower and two large rain shower heads. The traditional style curved marble countertop for the vanity with metallic legs and towel rack is contrasted by more Contemporary elements in this mansion bathroom. Linear chrome-finished taps are used for the double vanity with swivel mirrors above each, underscored by a thin marble shelf. The gable roof of the house is followed by the sloping ceiling upon which a ball chandelier hangs over the circular freestanding tub in front of the white mullioned window. To the other side, a linear stone built-up serves as the fireplace, decorated with floral paintings. 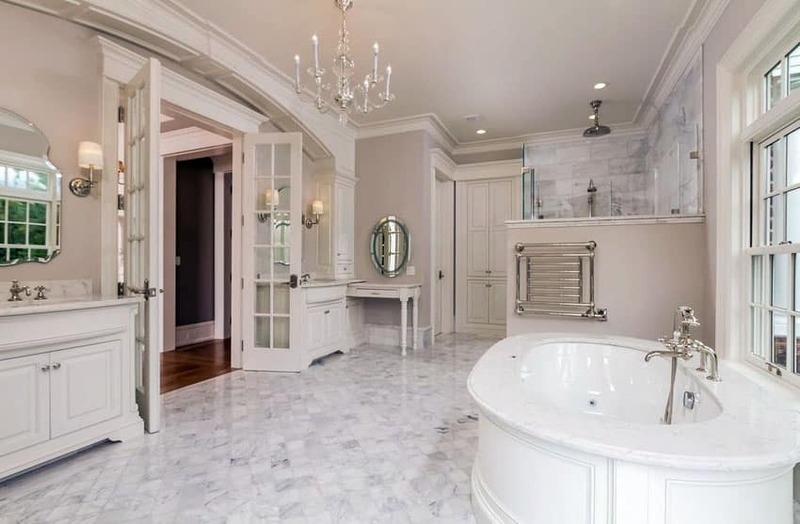 This luxury bathroom features a set of white mullioned glass double doors opening up to a lavish central tub with white recessed paneling on its base and silver taps on a white stone top. Squared marble floor tiles run diagonally all across the bathroom floor and are also used for the shower enclosure with rain shower. The marble goes well with the light beige wall, white cabinetry, silver trims and dainty central chandelier. The grey and brown basket weave mosaic tiles used for the semi-hexagonal tub area goes well with the large custom wood vanity with raised paneling on one side, complete with brown stone countertops and vintage style wall sconces. A wooden bench is placed under the vanity’s hollow, and the mirrors are shaped to match the arch and curvature of the customized built-up. Natural stone tiles are laid on the bathroom floor and goes well with the kitschy zebra-patterned Ottoman at the foot of the tub. This Mediterranean style luxury bathroom features mosaic tile and brown stone slab steps leading up to the white bathtub with oiled brass taps. An intricate black iron and frosted glass chandelier hangs over the tub, and the tub is also surrounded by a wood shuttered window and a fireplace recessed into the rustic stucco wall. The rest of the bathroom features brown baseboards and cornices, which was also used for the raised panel cabinets and drawers for the vanity. A pair of intricately carved stone pillars holds up a coved marble ceiling over the tub of this palatial master bathroom. Granite steps lead the way into the rimmed white tub complete with window and classic style drapes. To the opposite side, the vast vanity counter sits below an archway, where the mirror has been shaped to cover the entire wall and is lit by traditional wall-mounted lamps. Rich brown wood is used for the recessed panel cabinets and drawers, and is also used for the door and the smaller vanity counter beside it. Featuring light beige walls and white baseboards, cornices and window frames, this bathroom is large but retains a simple timeless style. Large cuts of white Calacatta marble are used for the floor, with a heavier grained variant used for the shower enclosure, complete with bath bench and rain shower. Across this, a white bean-shaped tub sits on the floor with silver taps. A window and a high glass storage cabinet sit beside the main vanity area, with a large white wood trimmed mirror and matching white painted wood dresser and cabinets. 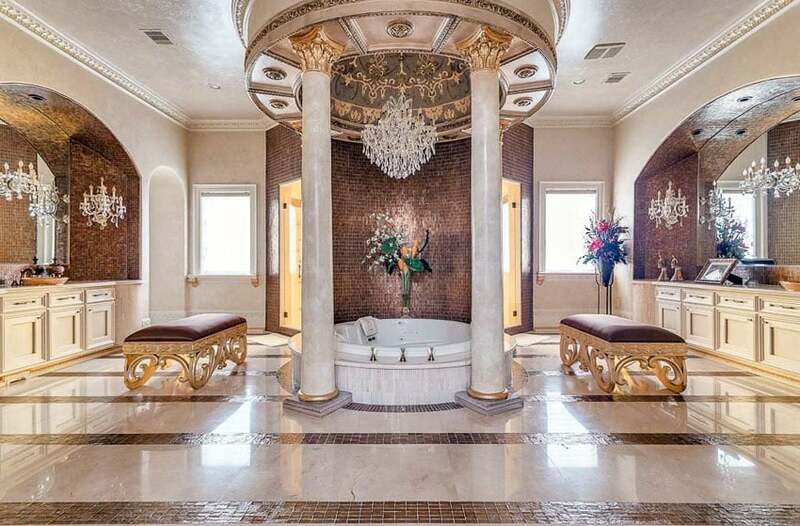 The large whirlpool tub is the center of this Louis XIV style luxury bathroom, with its body mounted onto a brown-gold stone built-up from the wood tile flooring. The walls are done up in a beige textured paint that matches well with the bright gold accents on the cornices, furniture and lighting. The luxe style of the bathroom is completed by the long floor-length drapes and white velvet tufted Ottomans strewn around the room. 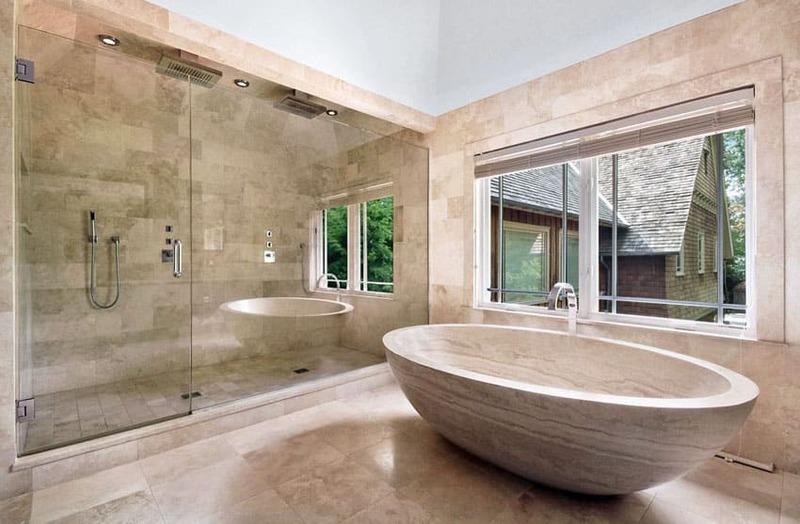 Heavy-grained stone tiles line the walls of this luxury bathroom, particularly the semi-circular outcrop broken only by wood-framed windows and frameless mirrors. Below this semi-circular area, a thick wood countertop holds up a pair of low bowl-type lavatories with silver pedestal-type taps. This modern Zen-inspired setup is given a more luxurious feel through the use of gold mosaic tile for the accent wall above the boxy white bathtub. A large fireplace is the centerpiece of this Classical luxe bathroom, complete with Neoclassical mantel and arch, and granite stone bench. A circular Persian rug sits on the stone tile floor beneath it, a great accent to the room’s subtle white and gold wallpaper. To one side, the corner shower enclosure is tiled with the same stone tile and accent mosaic tiles in darker colors. It is fitted with a rain shower and a bath bench. A recess to the side of the fireplace features a black stone vanity counter on top of white raised panel cabinets. This all white bathroom features Classical profiles and a pop of modern luxe with its gold bathroom accessories. The white ceramic tub features gold bear claws on its base as well as a floor-mounted gold tap set, emphasized by the diamond-cut mosaic mirror behind it, centered on two large windows with ledges. On either side of this, the walls feature a quilted white tile with gold points, and backs the gold mirror and gold wall sconces well over the white lavatory counter set with undercounter drawers. The lavatory taps and cabinet handles are also in gold, along with the towel rack on the other side. 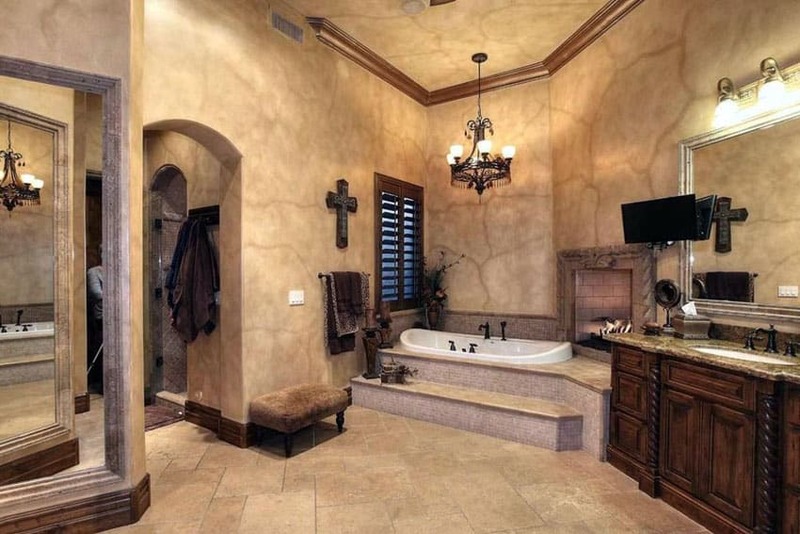 Mansion bathrooms often go for a cohesive theme that creates a specific feeling and ambiance when one enters the space. 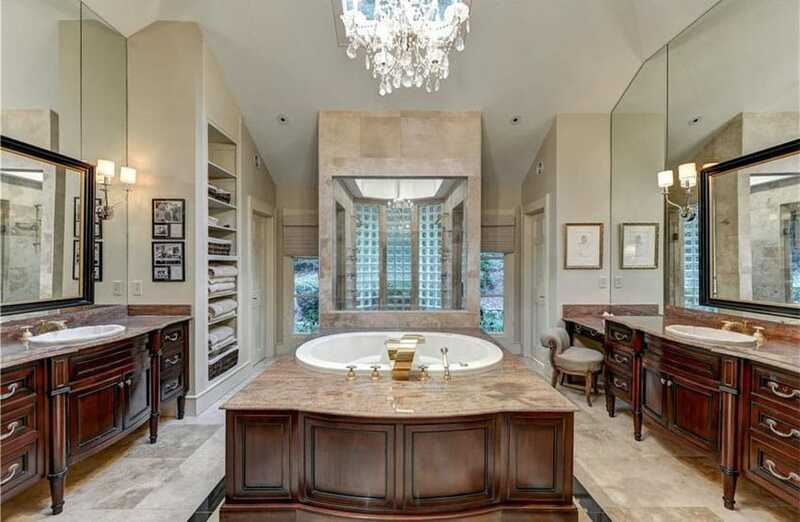 A tufted white leather Ottoman sits on the wood laminate flooring leading to this luxe master bathroom. A small laminate strip on the floor separates the walk-in closet laminate flooring from the brown stone tile used for the bathroom floor that continues up to the glass shower enclosure. The beige walls of the bathroom feature a white recessed panel wainscoting on its bottom half, particularly toward the back wall’s two windows framing the standing white tub with wall-mounted tap. On the other corner, a pair of tall standing shelves are centered on a white painted wood vanity set with frosted glass cabinets and curvy pedestal sinks on top. This Tuscan style bathroom starts with an arched alcove for the white bathtub, mounted onto a stone subway tile built-up with warm wood top. This alcove, in natural stone beige, is carefully decorated with Tuscan elements like the potted plants, candleholders, white lace curtains and chintz stool. The shower enclosure also features the same Tuscan luxe feel with patterned tiles on the wall, bronze taps and a maroon mosaic tile used on the floor. Across this area us a polished wood countertop lit by frosted glass and oiled brass wall sconces. Heavy white curtains pulled back by black and gold tasseled tie-backs open up this Zen-inspired master bathroom with treated warm wood floor strips. A stone-shaped free-standing tub sits at the center of the bathroom, lit by a Contemporary style textile pendant lamp. It also features a small wooden coffee table and towel rack. On one side of it, a clear sheet of glass separates the shower enclosure, while a dark wood table carries a pair of similarly Zen-inspired pedestal sinks. The very back of the bathroom features a wide picture window looking into the outdoors, also separated by the same white heavy curtains and black tasseled tie-backs.